This note follows directly from Technical Note 9, but focusing now on subglacial bedrock disruption and the associated mechanisms for transferring water, pressure and heat. Observations of disrupted bedrock occurrences on the Avalon Peninsula suggest that many of features were formed beneath thick cold-based glacial ice cover. Questions associated with the subglacial-origin model include: 1) What is the source of pressure (energy) causing bedrock disruption? 2) How is the pressure transferred through bedrock to a site of subglacial frost wedging? 3) Given that a phase transition is involved, how is the associated latent heat transferred? 1) The energy source for the process includes two aspects. Firstly, energy is needed to establish a non-equilibrium (subject to a pressure gradient or concentration gradient) population of mobile (non-crystallized) water molecules in frozen bedrock. This energy source could be hydraulic (up-slope glacial ice) or it could be elastic energy stemming from the unloading of bedrock previously loaded by thick glacial ice that thins as deglaciation proceeds and it could include thermal energy remaining from a previous period when the bedrock was warmer. Secondly, energy is needed to drive the mechanical process (do work) associated with fracturing and shifting bedrock. Based on observations and analysis of disrupted bedrock features, it appears increasingly likely that thermal energy , as opposed to hydraulic energy, can directly account for the work done in shifting bedrock in most situations. The problem with using a hydraulic-energy model stems from the need to transport hydraulic energy over substantial distances through frozen bedrock. 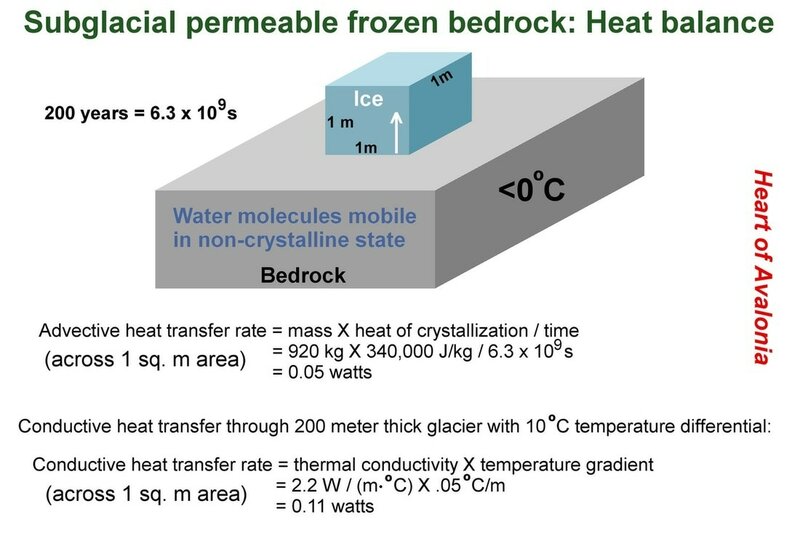 Thermal energy, transported through permeable bedrock via advection, can be converted to mechanical energy by ice segregation at the site of bedrock disruption. The theoretical need to conduct hydraulic energy (pressurized, free-flowing liquid water) through bedrock chilled to subfreezing temperatures is thereby eliminated, as is the need to keep this water from leaking and transferring excessive amounts of heat. 2) The transfer of pressure (or energy) through bedrock can be achieved by converting upstream pressure (energy) to chemical energy, moving the chemical energy through bedrock via molecular diffusion or flow (an advective process) and then reclaiming part of the initial energy as work through the heat-to-mechanical energy conversion process intrinsic to frost wedging by ice segregation. The description "chemical energy" used here refers to the increased potential energy of confined water molecules interacting with pore surfaces in bedrock relative to the lower energy of water molecules incorporated into a macroscopic ice crystal. It is assumed in the present analysis that this "chemical energy" matches the energy differential between water molecules in the liquid state (water) versus the energy of water molecules in the crystalline state (ice). This assumption is only an approximation. 3) The heat removal necessitated by extracting mechanical energy from ice crystallization across a temperature gradient (ice segregation) can be achieved entirely by conduction through overlying glacial ice, even when this ice is 200 meters thick (see diagram below). The key parameter needed to rationalize this assertion is the time taken to form a subglacial disrupted bedrock feature. This time is measured in centuries, not years. Primary assumption: The bedrock hosting the large subglacial frost-heave features seen on the Avalon Peninsula is permeable to water at temperatures substantially below the freezing point. It is assumed that the rock is initially saturated with water from tens of thousands of years of preceding pressurization under warm-based glaciers. After warm-based glaciation shifts to cold-based glaciation, water molecules in the now-frozen subglacial bedrock remain mobile via disruptive molecular interactions with rock molecules (Gibbs-Thomson effect). There are two principal sources of water molecules potentially migrating through bedrock under a pressure/concentration gradient toward the subglacial ice/bedrock interface. 1) Water was present in the rock initially. This water, a remnant of preceding thick, temperate glaciation, has positive pressure relative to the declining basal pressure of a thinning overlying cold-based glacier. As deglaciation progresses under cold, dry climate conditions, this water continues to migrate toward regions of lower pressure. 2) In a polythermal glaciation model, water enters unfrozen bedrock beneath thick temperate ice, then migrates through permeable bedrock into a zone where bedrock is frozen but where subglacial pressure is lower because overlying ice is thinner. Some field observations on the Isthmus of Avalon warrant consideration of a third process whereby pressurized cold ice directly contacting frozen bedrock enters the bedrock in a situation resembling ice segregation running in reverse. In this case, the entry of surface molecules from the ice into the rock could be considered to be pressure melting, although the "melting" comprises the shifting of water molecules from the partially disrupted environment of a crystal surface into the more disruptive environment of bedrock pore space. It is unclear if this kind of process would proceed at a significant rate when the temperature at the ice-rock contact is much below the ice/water pressure melting point. The process would be aided by the high pressure/concentration gradients associated with transport of the resultant pore water to a site of nearby regular ice segregation. In this situation, pressurized cold ice enters frozen, permeable bedrock and re-emerges a short distance later upon contact with a mass of segregated cold ice at lower pressure. This would comprise a slow-motion low-temperature version of the regelation plucking process common in warm-based glaciation. In all three of the mechanisms described above, newly introduced water molecules (or those already present, but under pressure) move slowly through defects in bedrock by diffusion and/or flow, guided by a concentration gradient or a pressure gradient. The molecules re-emerge at a site of ice segregation. Capillary action, a process commonly associated with ice segregation in frozen soils, may play a lesser role in drawing water toward sites of subglacial bedrock frost wedging. Capillary action depends on a gradient in the concentration of water molecules along the walls of a capillary. The action is most effective when a capillary becomes essentially desiccated in the close proximity of a segregated ice mass at subfreezing temperature. In deep subglacial bedrock, thermal gradients and water concentration gradients along flow paths are low and transport distances may be long. This situation leaves the precise mechanism of transport of pore water toward sites of subglacial ice segregation in need of further explanation. A question arises as to whether the proposed permeability/diffusion/flow mode of action requires a special type of bedrock. The action is demonstrated on the Avalon in varying rock types, including metasomatized igneous rock and sedimentary rock. However all of the bedrock hosting large subglacial frost-wedge features has been subjected to regional metamorphism and most of the rock shows a schistose or slaty texture. The host rocks contain phyllosilicates, water-rich minerals with a two-dimensionally bonded structure that would tend to imply permeability, albeit in preferred crystallographic directions. ​Joints in bedrock hosting subglacial frost-wedge features may serve more as collectors of ice than primary conduits for H20 transport. Within the model under present consideration, significant movement of water molecules is assumed to occur through unbroken frozen bedrock. When these water molecules encounter a joint of macroscopic width, crystallization commences in the joint and an ice segregation process begins. If the pressure environment is such that the mechanical forces associated with ice segregation can widen the joint (most likely this situation will prevail upon approach to the bedrock-glacier interface) the joint will expand into a fissure (see Technical note 9). Fissure creation is the initial process leading to larger-scale bedrock disruption and frost heave. By down-weighting the significance of joints as exclusive conduits for water molecules, a possible concern relating to insufficient cumulative pore cross-sectional area is avoided and bedrock becomes more analogous to fine-grained, low-porosity soil. The diagram below illustrates the heat balance considerations for a subglacial bedrock frost-wedging occurrence. In the above diagram, it is assumed that a subglacial frost wedging event involves the transfer of 1 cubic meter of ice through bedrock to the bedrock-glacier interface. The transfer is assumed to occur over a 200 year period. The water molecules travel by diffusion or flow through frozen bedrock, retaining elevated potential (chemical) energy which is converted to heat as the water crystallizes against an existing ice mass. The advective heat flux associated with the movement of the water molecules is 0.05 watts per square meter. It is then assumed that a cold glacier overlies the site and that the average surface temperature (glacier-air interface) is 10 degrees C below the temperature at the ice-bedrock interface, which lies 200 meters deep. It is further assumed that heat flux through the glacier is stabilized (this takes decades or centuries to achieve following abrupt climate change, see Technical note 2) and therefore linear. The flow of heat toward the surface from the base of the glacier is 0.11 watts per square meter, more than enough to account for the heat released by crystallizing pore-water. This simplified heat balance analysis suggests that bedrock frost heave could occur subglacially during the Younger Dryas cold period, via ice segregation, as long as the frost heave occurred very slowly.